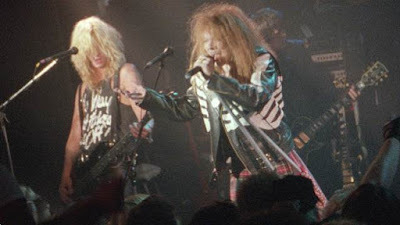 Filmed live in 1989 at the Cathouse nightclub in Los Angeles, "It's So Easy" was never completely finished and remained in the vaults, unseen and unreleased. The footage was recently uncovered for inclusion in the box set and has been digital restored in 4K UHD from 16mm film transfers with the original conceptual scenes edited back in with the live footage, just as the band had originally intended. You can view the full video of “It’s So Easy” at Apple Music. The newly announced "Locked N' Loaded" deluxe boxed set of "Appetite For Destruction" also includes B-sides from the "Appetite" sessions, the 1986 "Live ?! *@ Like A Suicide" EP and three of the four songs from the band's 1988 acoustic EP "GN'R Lies". The deluxe edition will contain 73 songs — including 49 tracks that never before been released — spread out across four CDs and seven 12-inch 180-gram vinyl LPs. A super deluxe version will also include a 96-page book with unreleased photos from Axl Rose's personal archive, new lithographs and a plethora of memorabilia. Three decades after its release, “Appetite For Destruction” remains the biggest-selling debut album of all time with more than 30 million copies sold worldwide. Guns N’ Roses will resume the Not In This Lifetime reunion tour in Berlin, Germany on June 3.